Bashore Ridge Loop is located in Hobbs State Management Area. The trail is 100% singletrack and is a multi-use trail. Expect to see very little other trail traffic, but you could also encounter hikers and horses. The surface is mostly hard packed with some sections of loose gravel. 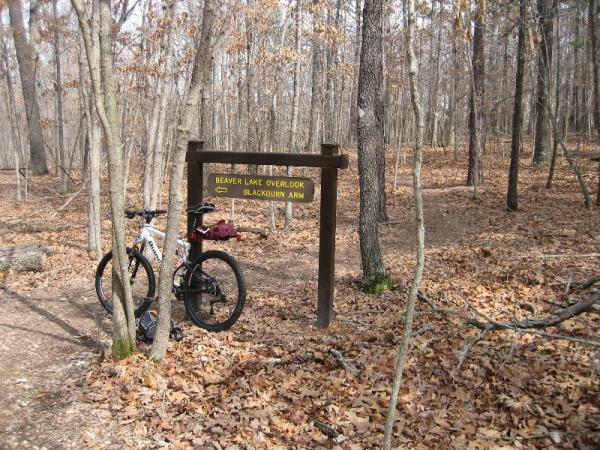 The entire trail is in a wooded area and has one major hill climb in either direction. This trail is one of three loops in the current trail system. Review: Very fun trail that traverses both sides of Bashore Ridge. It is considered by the park to be the easiest trail in the system but still has climbs that will get your heart rate up. Excellent signage lets you know what to do at intersections and points out interesting features. A fast ride with some scenic views of Beaver Lake. Review: it's a great place for me to take my son and my friends that aren't comfortable. i recommend it for family outings. plus the caves are pretty neat. Review: I've ridden this trail more than any other and it is a fine beginners trail but I wouldn't put it in the top 100. There's several trails that are better then this one within a 45 minute drive. Lake Leatherwood, Devils Den and Slaughter Pen are just a few. I haven't even ridden the Syllamo loops yet but I've heard great things about them as well. Review: This trail is a great clean trail with lots of down hill track. But you must keep in mind what goes down must come back up lol. If you are around Rogers this is a fun fast track as are all 4 of the loops at Hobs. Bashore Ridge Loop MTB Trail 3.80 out of 5 based on 5 ratings. 5 user reviews.